Click Here To Enlarge Photo You can tell Fall is arriving when you start seeing the burgundy colors begin to emerge in the bridal bouquets. Roses are perfect for a fall bouquet, but the accent of burgundy dahlias give this bouquet the touch of a southern fall season. Call me and we can discuss your wedding flowers and which flowers will preserve beautifully. Click Here To Enlarge Photograph So many beautiful flowers available for fall weddings, but you can always rely on roses to be the number one flower in most weddings. 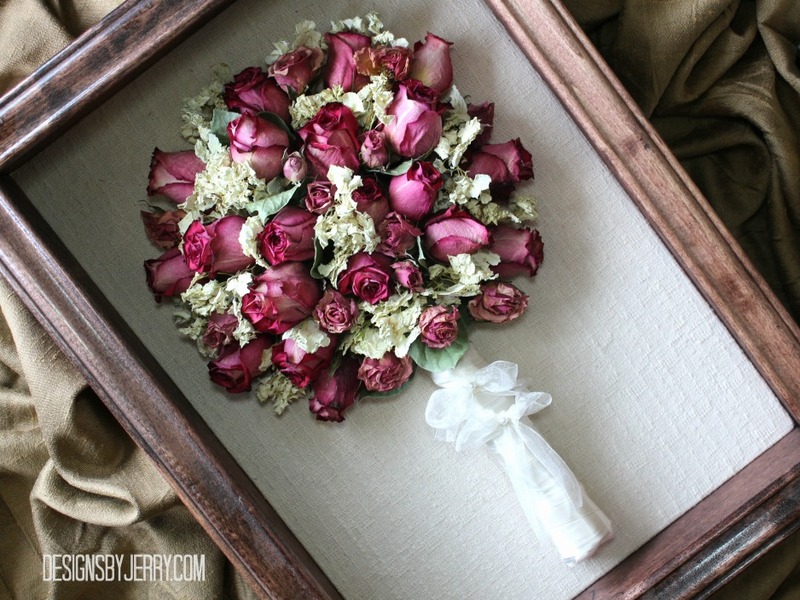 This bridal bouquet was filled with a variety of beautiful roses. 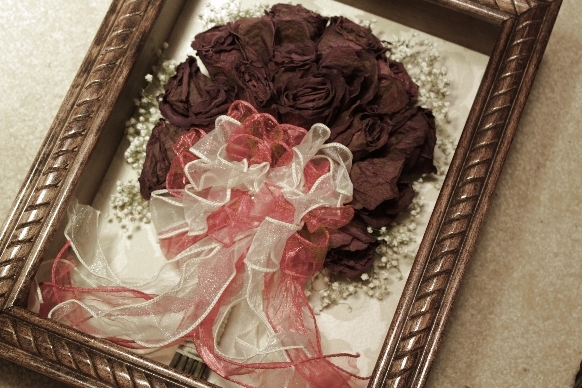 At Designs By Jerry, we have found how to preserve roses beautifully. 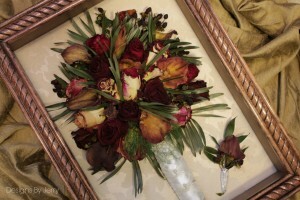 Originally this Bridal Bouquet was very dramatic. The cascade bouquet was adorned with a variety of glorious foliages that literally draped the floor as the Bride walked down the aisle. 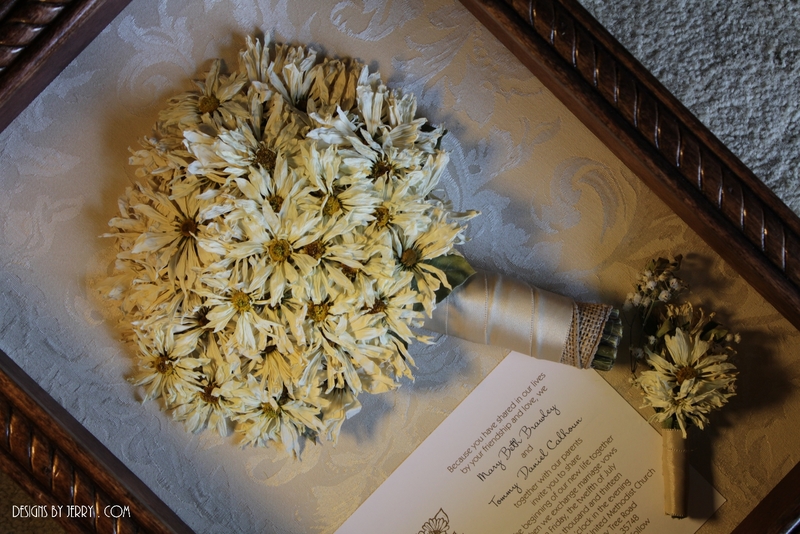 Now, of course, to fit it inside a shadow box, we had to eliminate most of the foliage, but you can still imagine just how beautiful this bouquet was on the Bride's wedding day. 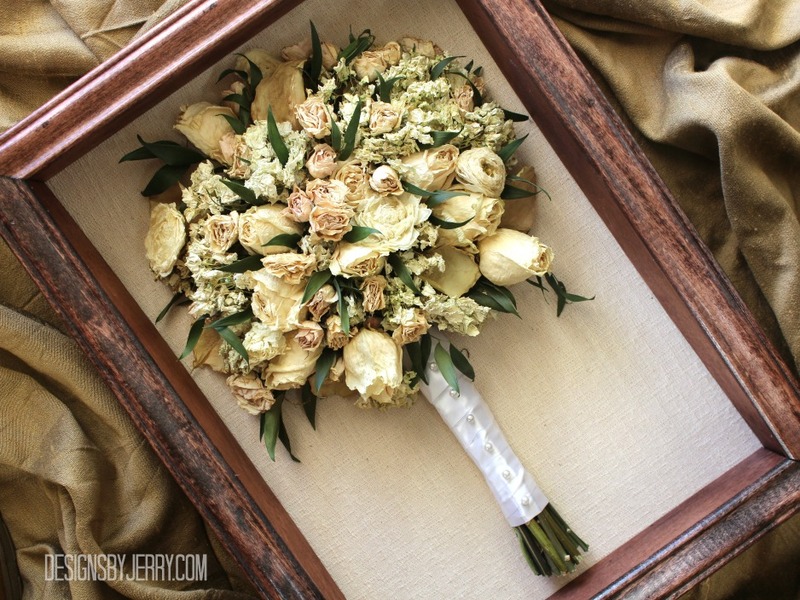 Filled with cream colored roses and miniature garden roses, this bouquet had a dash of white peonies as well. But, the attention grabber was most definitely the foliages. This was such a beautiful bridal bouquet and I was happy to have the chance to preserve the bouquet for the Bride. In this bouquet the primary flowers are roses. A cream rose as well as a cream rose with a hint of pink is used in this bouquet. Just a touch of pink peonies were used, which gave the bouquet a dash of southern elegance. 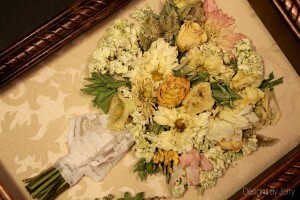 Cream Stock was also used as well as just a few touches of white ranunculus. Many of the roses will lose their color over time after they have been preserved. I have found that the hot pink rose is one that will have an almost everlasting bright pink hue for years to come. So, if you're looking for the perfect rose to preserve, you may want to speak with your floral designer and request a hot pink rose. 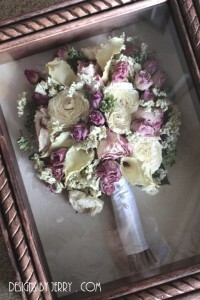 In this bouquet, the bride chose a large bouquet of hot pink roses and white hydrangea. Together, these two flowers create a beautiful southern bouquet. This Bride chose to go with a smaller bouquet, but flash was not missing from her wedding. She chose very small Escimo White Roses and White Hydrangea as the only two flowers in her bridal bouquet. 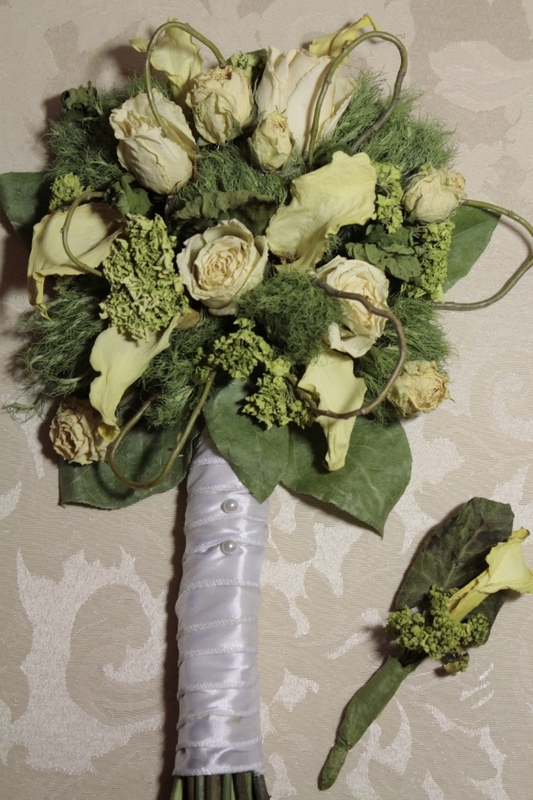 It was accented with green Salal leaves and tied off with a cream double-faced stain ribbon. 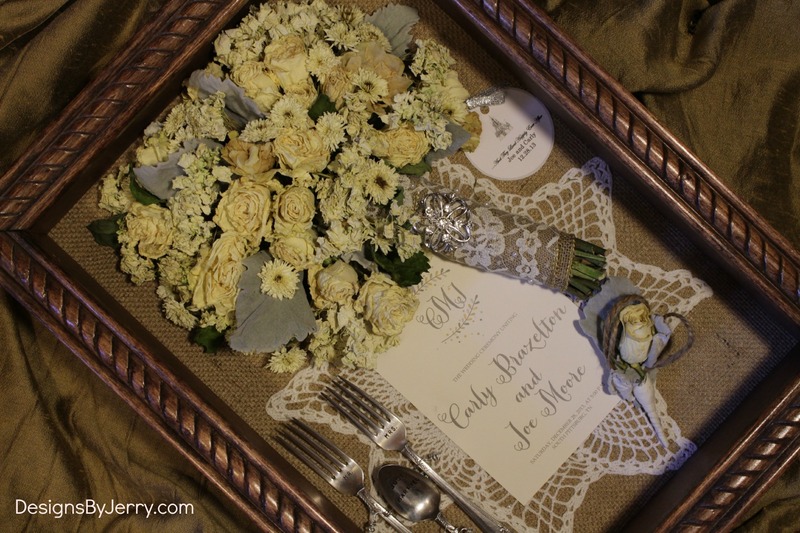 She also chose to add some memorabilia from her wedding to be included in the shadowbox. This gives a brief glimpse into the memories of her special day. Click Here To Enlarge Photograph When choosing your wedding flowers, your personality and the wedding theme you have chosen will always dictate the flowers you choose for your bridal bouquet. 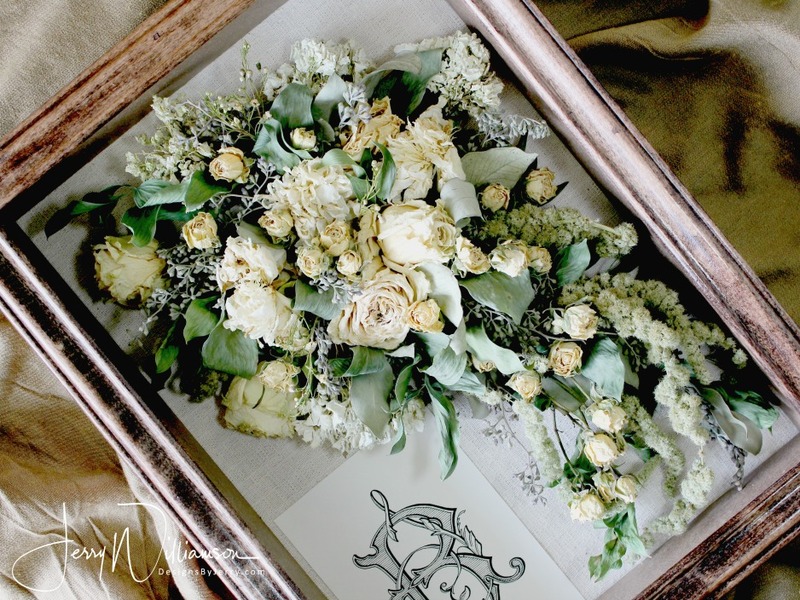 Tradition tends to reign in most cases when it comes to wedding flowers. And, that's why roses and hydrangea are always a safe bet when you are picking flowers for your wedding. There are so many varieties and colors of roses to choose from that you will almost always be able to find a rose that will compliment your "look" you are going after when designing your wedding. Here is the south, hydrangea is almost always a favorite. It is southern, traditional, brings a lot of impact and luxurious. These two flowers also preserve beautifully. Make sure you let your floral designer know if you plan on preserving your bridal bouquet so they can make sure they offer you the flowers that will dry beautifully. Click Here To Enlarge Photograph Remember day dreaming about taking a stroll through a summer garden and gathering flowers for your wedding bouquet? That's what I always think of when I create a mixed summer variety classic garden bouquet. There's no right or wrong....no specific dominant color, but a gathering of complimentary colors and textures to create something so meaningful. 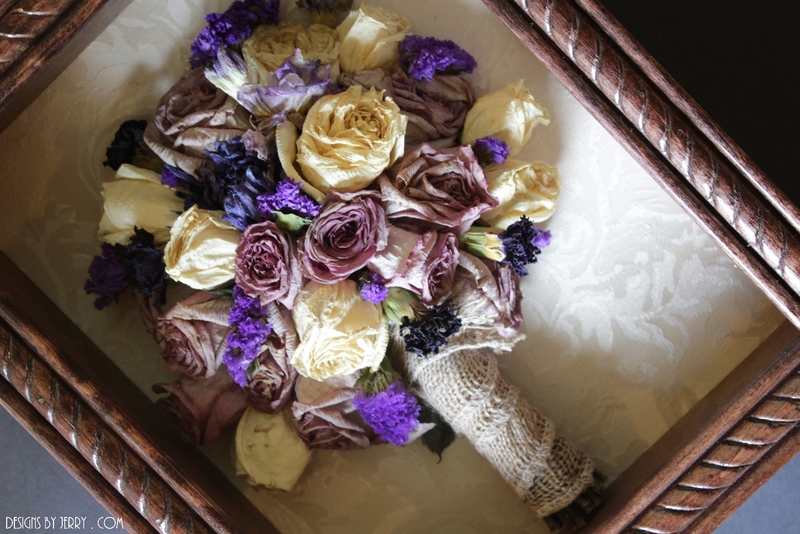 These bouquets are always fun to preserve because the roses are always fun to work with as well as hydrangea. Bouquets are becoming larger and the design styles are changing. It's always so much fun to get to work with the new and cutting edge bouquets. 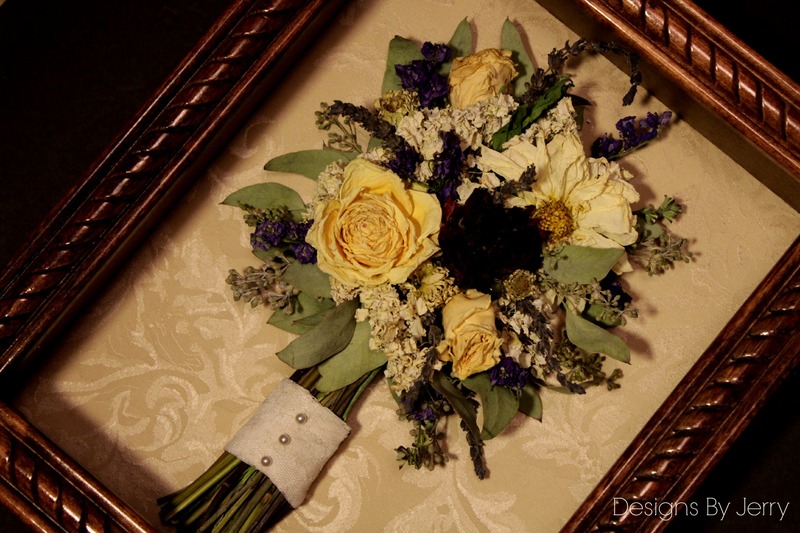 As you will notice this bouquet is much wider and shorter than the round looking bouquet you may be accustomed to seeing...so, we turned the shadowbox horizontal to help keep the true character of the bouquet. 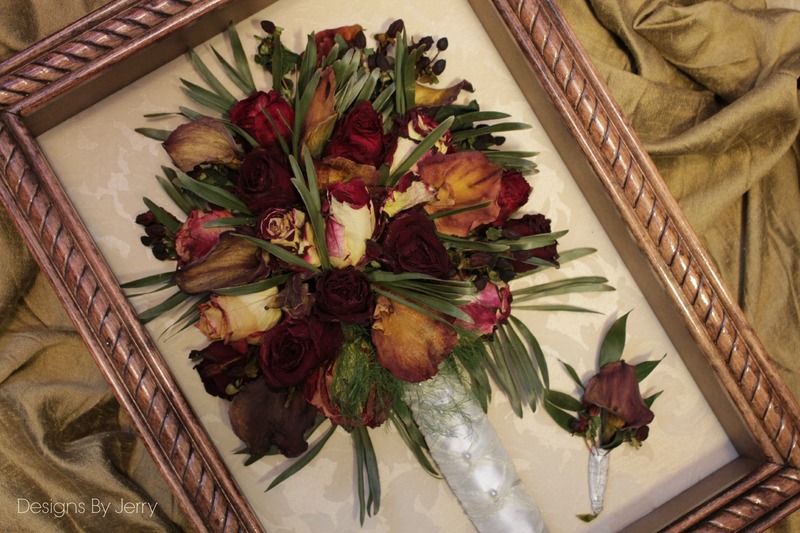 In this bouquet were dark burgundy dahlias, sterling silver roses along with a variety of garden foliages. 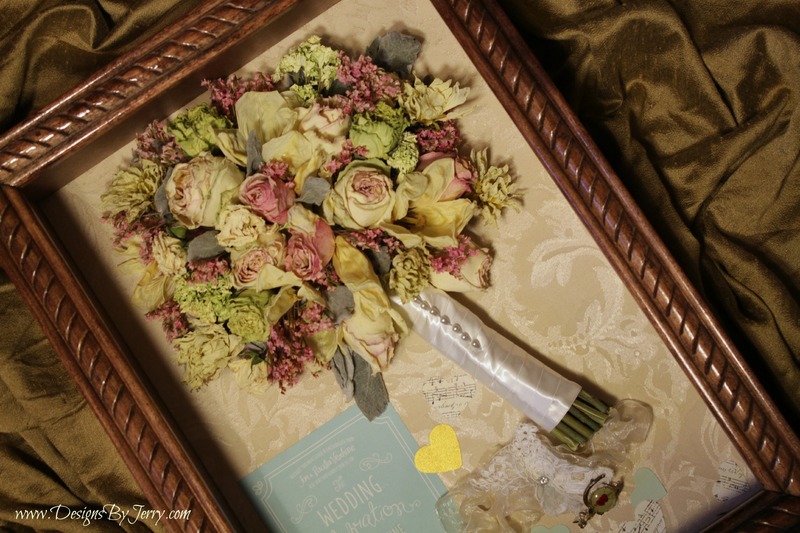 The bride had included miniature pictures of her family members and we removed these for the drying process and then reattached them to the bouquet handle once the flowers were placed back into the display box. Another new trend is long flowing fabric for ribbons...so we puddled the ribbons in the bottom of the box. 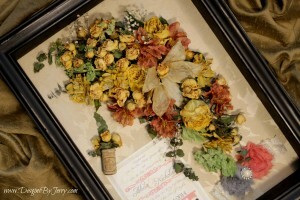 We preserved this little beauty and added in the flowers from the two Bridesmaid's bouquets as well. 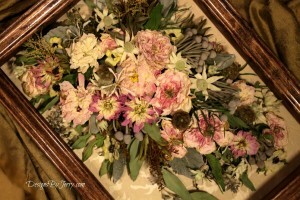 The Bride used pink roses, deep purple dahlias, lamb's ear, berries and succulents. Since succulents don't dry well, we substituted in permanent botanical succulents...and they look fabulous. 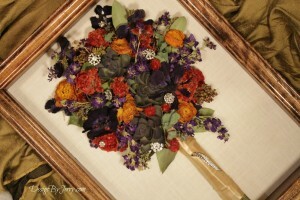 Fall weddings always lend themselves to beautiful and colorful bridal bouquets. In the fall we have such a large variety of unique flowers along with a large selection of vibrant colors to add into the wedding. 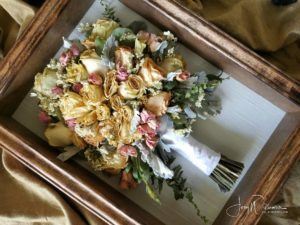 This wedding bouquet was preserved and displayed in a custom designed and hand crafted shadow box to display the wedding flowers forever. Hydrangea is still one of the top flowers that brides are turning to for their Southern Weddings in 2015. This bouquet featured a blue hydrangea and then added white gerbera daisies to give a floral impact for this Huntsville Wedding. The bride loved Bling so she added Rhinestones to her wedding accents and we were able to get her wedding dress belt as well as her rhinestone hair comb added into the shadow box. Also added were her invitation and the groom's boutonniere. Click Here To Enlarge Photograph Bring me your roses...I'll take 3 or 4 of them and completely tear them apart...petal by petal. And then, I'll redesign the rose and re-create an exquisite Composite Rose...petal by petal. All roses preserve well, but just know that Red Roses tend to turn dark and even sometimes almost black...just depending on the rose. This display case is 4" x 4". We add moss to the pedestal and then add some growing out of the rose petals. And finally, seal the glass dome lid onto the preserved rose for a lifetime of sweet memories! 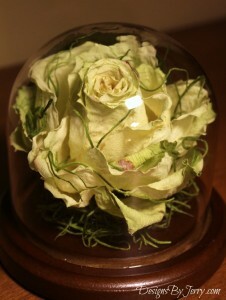 Green Composite Rose made from Lemonade Rose. Designs By Jerry preserved this bouquet and then redesigned the bouquet for a fitting lifetime of memories of a very special Wedding Day. White Roses, Yellow Spray Roses and Blue Delphinium in this lovely hand-tied bouquet. 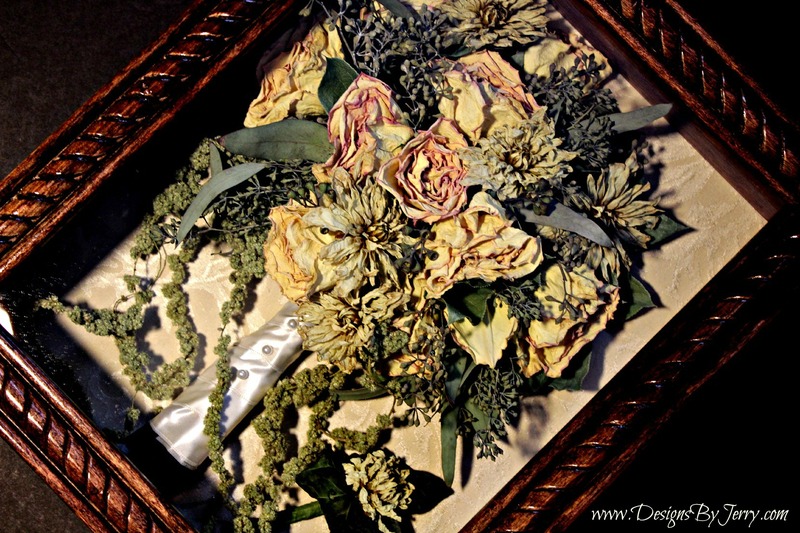 This bouquet preserved was a cascading bouquet and we added in the Mother's Handtied Bouquet at the bottom of the display. 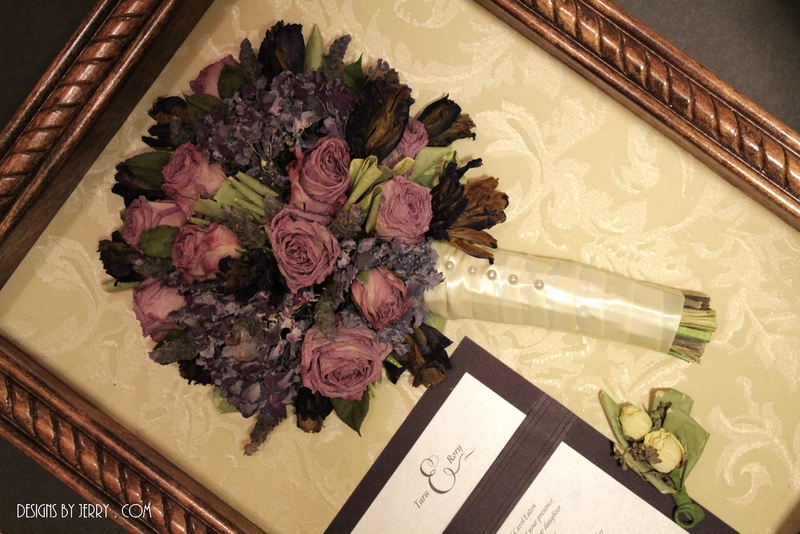 Each bouquet featured Sterling Silver Lavender Roses, Cream Roses, Eggplant Mini Calla Lilies, and Purple Stattice. The roses were accented with Rhinestones to give a shimmer to the preserved bouquet. We accept bouquets from florist all over Northern Alabama and Southern Tennessee. Please arrange to have your fresh flower bouquets delivered to us at Bishop's Flowers in Huntsville, Alabama by the Monday following your wedding. Contact Jerry for more details at 256-679-6227. This wedding bouquet is filled with beautiful flowers. During the wedding the bride carried this cascading bouquet which displayed a variety of beautiful foliages highlighted with Peonies, Dahlias and other beautiful flowers. Fall flowers of yellow ranunculus, purple stock, red celosia, purple anemones, red clover and eucalyptus all combined create a beautiful wedding bouquet of flowers for the Bride. 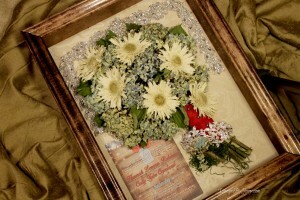 She had the bouquet accented with rhinestones as well as a rhinestone broach added to the handle of the bouquet. Also, in the fresh bouquet was a display of succulents. Since succulents won't dry and keep their shape and/or color (they just shrivel up) the mother of the Bride, provided some permanent botanical succulents to add into the preserved bouquet. Almost any flower can be preserved at Designs By Jerry. The trick is to contact us in advance and see if the flowers you are choosing will preserve well enough that you want to display it in a shadow box or not. We love to talk to Brides before the wedding even though it is not required. Talking to the Bride helps remove a lot of stress from the mother of the bride or the best friend trying to find the person to preserve the flowers and then making decisions that really need to be made by the Bride. 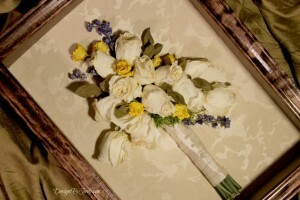 This bouquet turned out so beautifully....it was filled with Southern Charm. Mostly all white and cream flowers featuring Miniature Calla Lilies, White Roses, Dahlias, and even Gardenias. The Bride had plenty of glitter and bling added to take the Southern Charm to a entirely different level. We also included her headband in the shadow box as well as her garter and invitation. 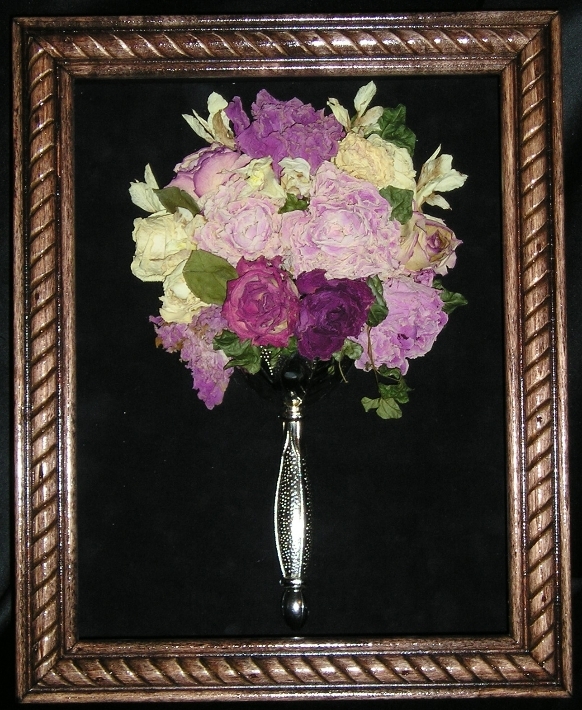 Calla Lilies, hydrangea, dalhias, roses and gardenia make a beautifully preserved bouquet. 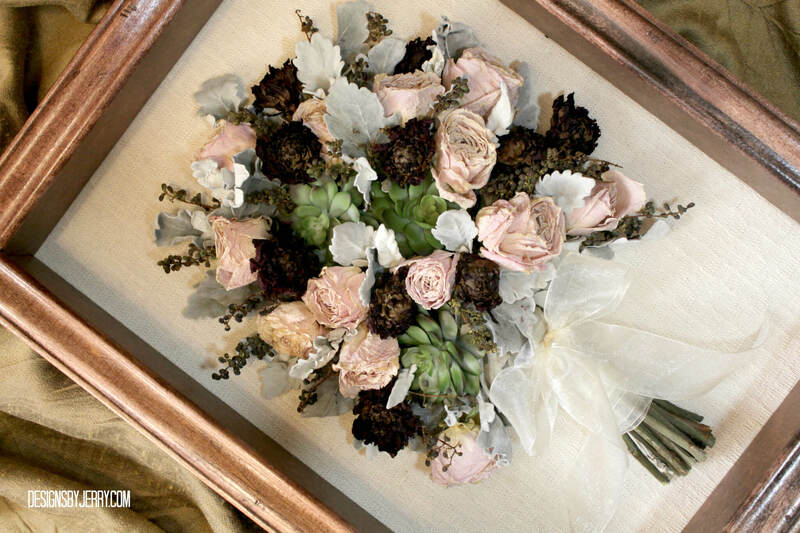 This preserved Bridal Bouquet shows how Hydrangea is still the Queen of the Ball when it comes to Weddings and Special Events! Click Here To Enlarge Photograph This bouquet was filled with beautiful flowers that would preserve perfectly. That always makes me happy! The base of the Bridal Bouquet was beautiful White Hydrangea then followed with Yellow Roses and Light Peach Roses. 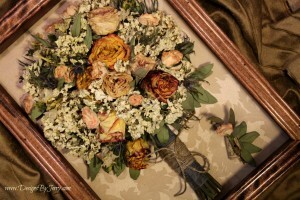 The designer then cleverly added tiny Peach Ranunculus which added a modern twist to this classic bouquet. 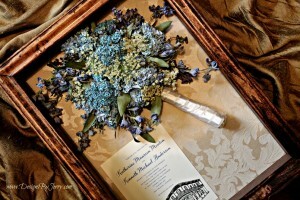 The Wedding Bouquet was also backed with Miniature Seeded Eucalyptus and then accented with Blue Thistle. I loved the Thistle. 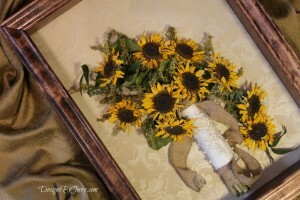 It added and texture to the bouquet that took the bouquet to a whole new level. 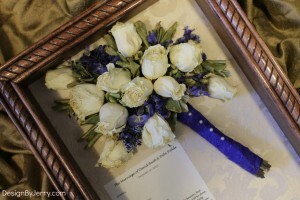 The bouquet stems were wrapped with an open weave blue ribbon and then topped with twine. Finished off with a twine shoestring bow was the perfect touch! 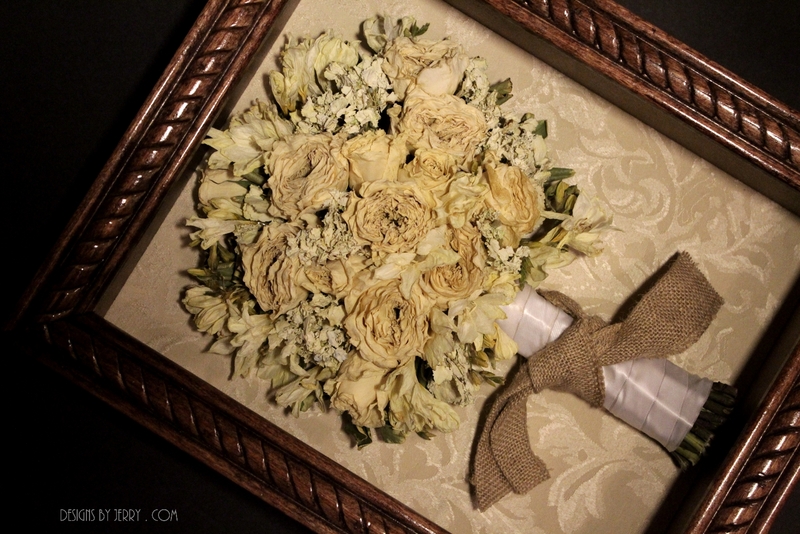 The Groom's Boutonniere was also added into the display case. 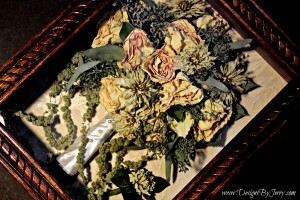 The preserved boutonniere was made of Miniature Seeded Eucalyptus and Ranunculus displayed on a Wine Cork. Click To Enlarge The Photograph Designs By Jerry at Bishop's Flowers in Huntsville, Alabama, serves Florists and Brides from all over Northern Alabama and Southern Tennessee. 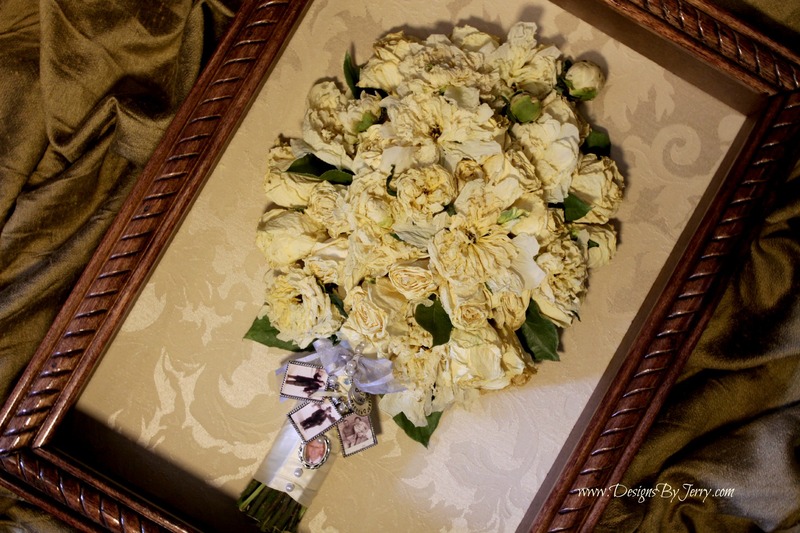 We focus on making a brides wedding flowers a keepsake memory and family heirloom. In this bouquet, Blue Hydrangea, Blue Delphenium, Queen Anne's Lace and Seeded Eucalyptus were all preserved beautifully. 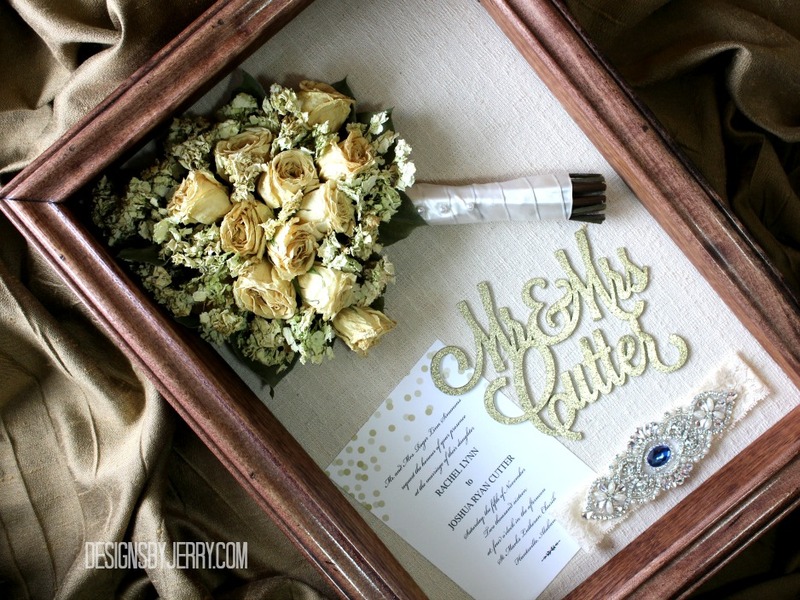 This Bride added her Wedding Invitation to the display. 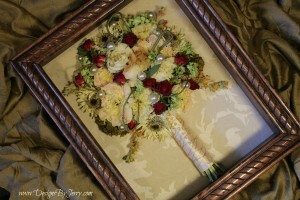 Click Here To Enlarge The Photograph This bridal bouquet preserved in Huntsville, Alabama was a lot of fun. The bride was very involved in this wedding and even designed her own wedding invitation...so we wanted to give it a lot of play in the display. 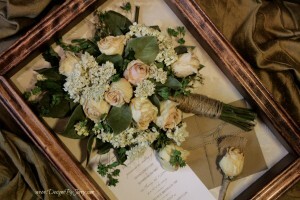 The flowers were very simple: white hydrangeas, cream roses, salal and white wax flower. Wax flower does not dry extremely well, but it still gives us a different texture to work with. Twine was the "ribbon" of choice for this wedding as the bride's bouquet was wrapped in this beautiful twine. 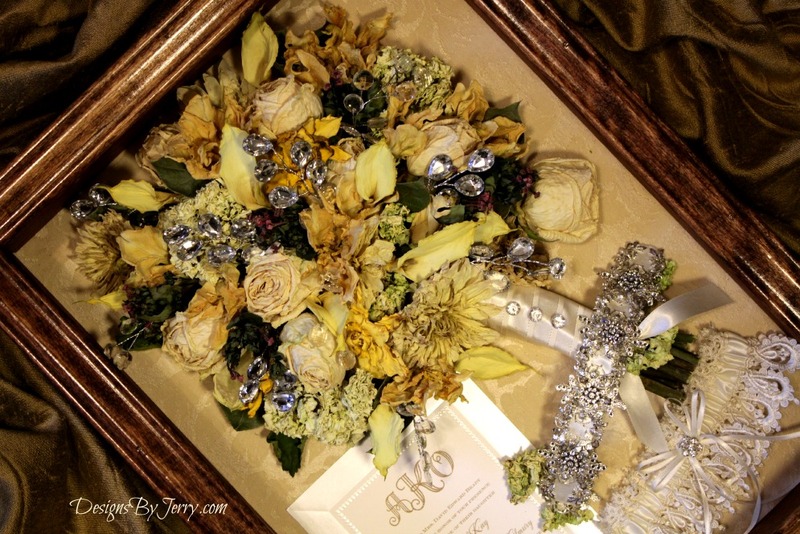 Click To Enlarge This Photograph If you are in Southern Tennessee or Northern Alabama, Designs By Jerry at Bishop's Flowers in Huntsville, Alabama, can preserve your wedding bouquet. 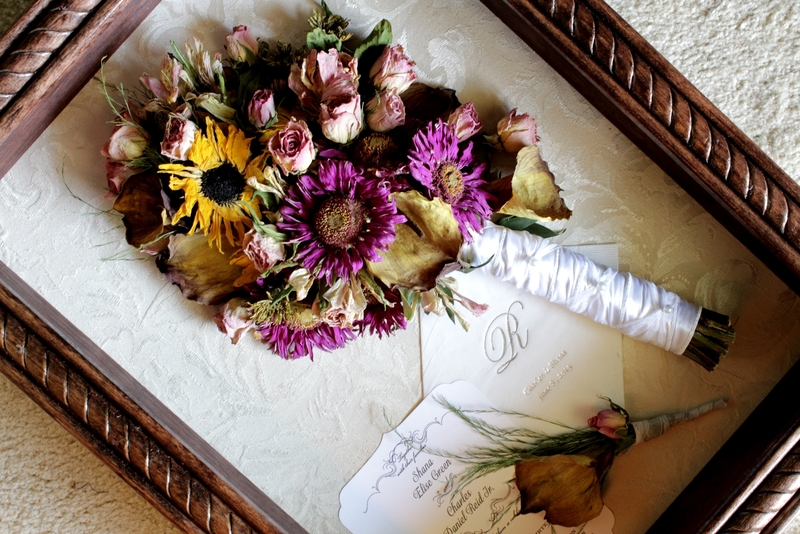 We work with florist from all over Southern Tennessee and Northern Alabama to ensure you have a beautiful bouquet once it is preserved...so check with us to make sure you are choosing the flowers that preserve the best! In this bridal bouquet, the bride chose a Cascading Bouquet filled with Yellow Roses, Yellow Spray Roses, Yellow Alstroemeria and Orange Alstroemeria. 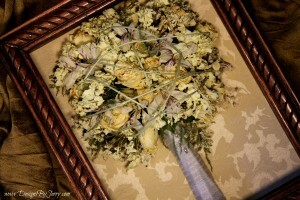 The bouquet was accented with one single Cream Enchantment Lily and then had a touch of Baby's Breath and Eucalyptus. Also, we added the Wedding Invitation, Groom's Boutonniere, and the Bride's Garter. Hydrangea, Peonies, Stock, Snapdragons and Roses preserved in Huntsville. 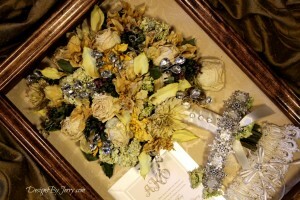 This Southern Belle Bridal Bouquet was a pleasure to preserve...hats off to the florist that created this work of art! To Enlarge Photograph Click Here This beautiful wedding bouquet was created with beautiful Peonies, Hybrid Roses and Garden Roses. 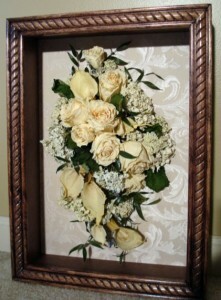 Designs By Jerry in Huntsville, Alabama has preserved another bridal bouquet featuring hydrangea! 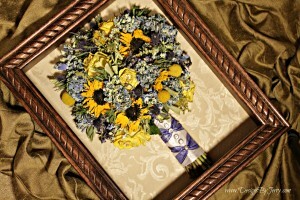 In this bouquet, blue hydrangea is the focal flower but then the bouquet is accented with sun flowers and yellow roses. This bouquet was finished off with a french braided handle of blue shear ribbon. 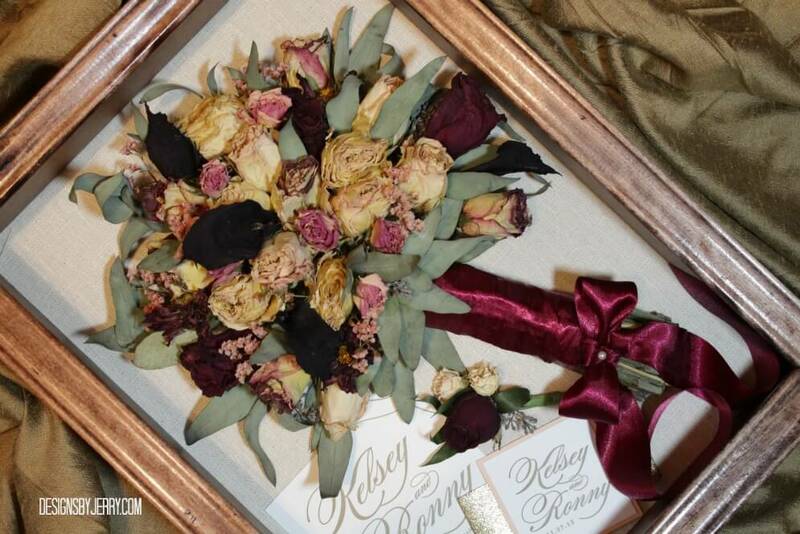 Preservation Prices start at $195 which includes preservation and the bouquet being displayed in one of our hand made shadow boxes. 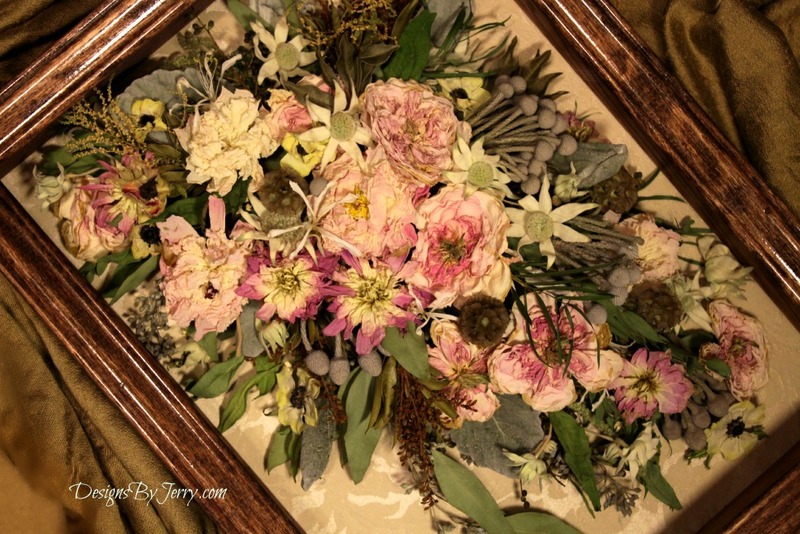 We preserve flowers from florist all over Northern Alabama and Southern Tennessee. 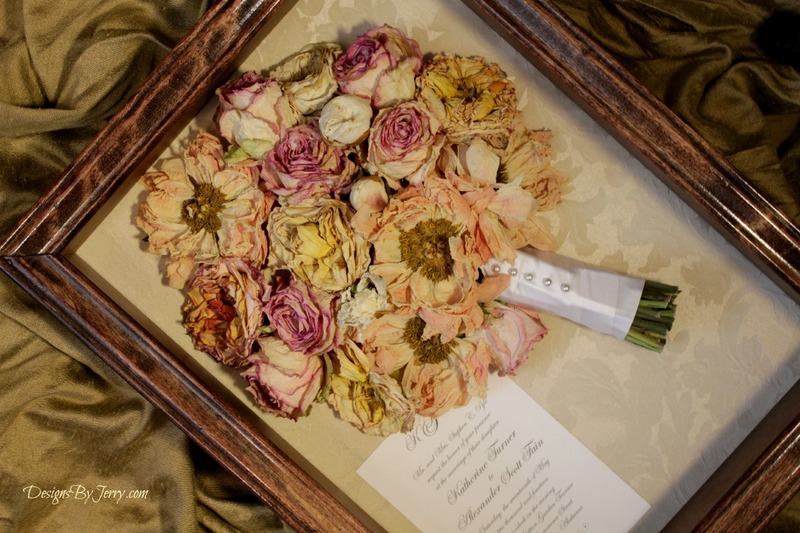 Ask your florist to contact us to ensure that your selection of flowers will preserve well so you can have a beautiful bouquet preserved for a lifetime of memories! Blue Hydrangea, Sun Flowers, Yellow Roses. Pink roses, Cream Roses with a Pink center and Chartruese Roses were the focal flowers for this Bride's Wedding Bouquet. Also preserved in the bouquet were White Tulips, Cream Dahlias, White Freesia, Pink Caspia and Lambs Ear foliage. 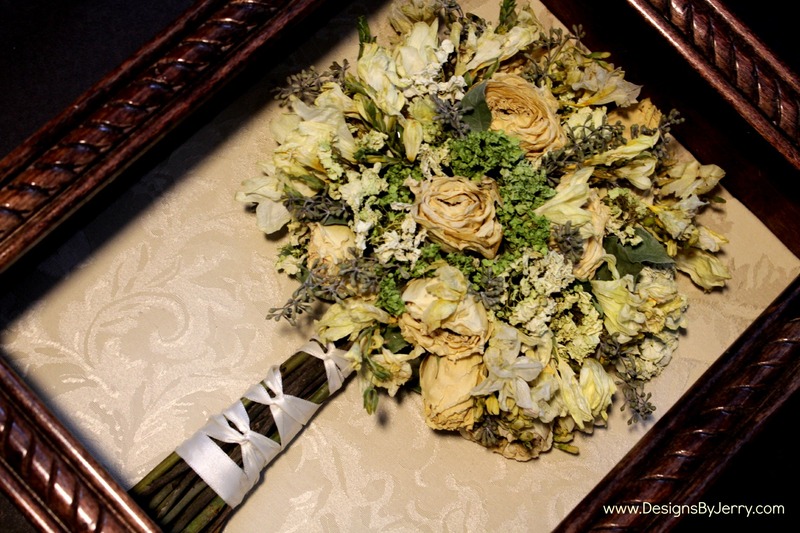 Click Here To Enlarge Photograph This week we preserved a bridal bouquet at Designs By Jerry at Bishop's Flowers in Huntsville, Alabama that featured a variety of roses, dahlias, seeded eucalyptus and hanging amaranthus. Click Here To Enlarge Photograph If you're looking to preserve your wedding flowers, you should check with Designs By Jerry at Bishop's Flowers. We are the only florist in the Tennessee Valley that preserves bridal bouquets in the Huntsville, Alabama area. 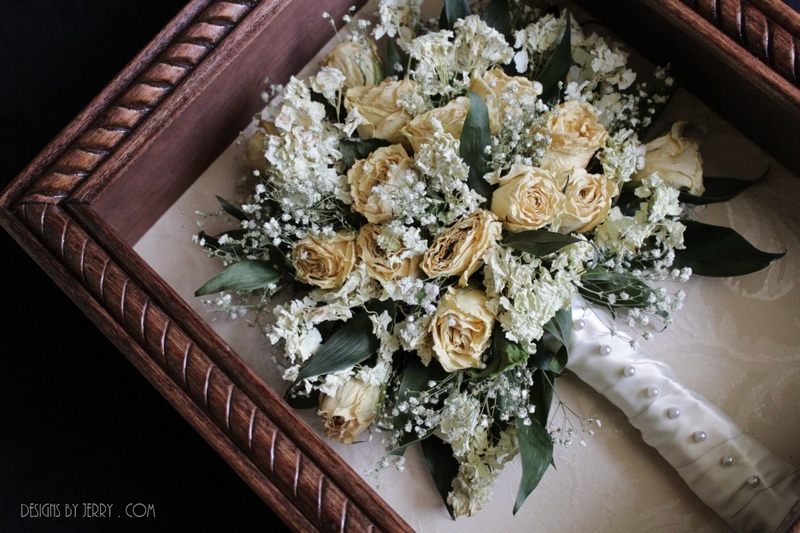 In this bouquet we preserved white roses, white hydrangea, baby's breath, and bear grass. We work with florist from all over Southern Tennessee and Northern Alabama to ensure that your bridal bouquet will make a beautiful lasting memory of your special day. Reservations are not required, but we do highly recommend a telephone conversation with the Bride so we can counsel her on how to take care of her flowers between her wedding day and getting them delivered to us. Glamour and Glitz was the theme of this bride's wedding. 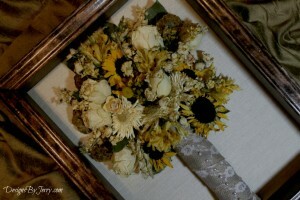 Click Here To Enlarge Photograph This bridal bouquet comes from Tuscaloosa, Alabama...Roll Tide! In this bouquet we preserved Peonies, Hydrangea, White Gerbera Daisies, Peach Stock, Red Spray Roses, Curly Willow (as a cage) and accented with over-sized Pearls. The handle of this hand-tied bridal bouquet is wrapped in cream satin ribbon and accented with Pearl Pins and Gold Bouillon. Remember: We preserve bouquets from all over Southern Tennessee and Northern Alabama. Click Here To Enlarge Photograph This bouquet is simple yet elegant. 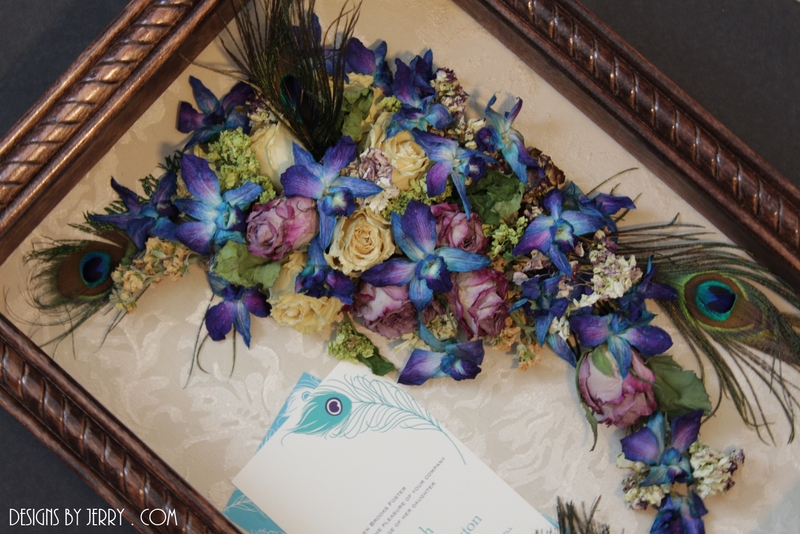 The bouquet was created with white roses and accented with blue delphinium. Tied off with a royal blue shear ribbon and highlighted with pearl pins. Our client added the wedding program to their shadowbox for keepsake memories. 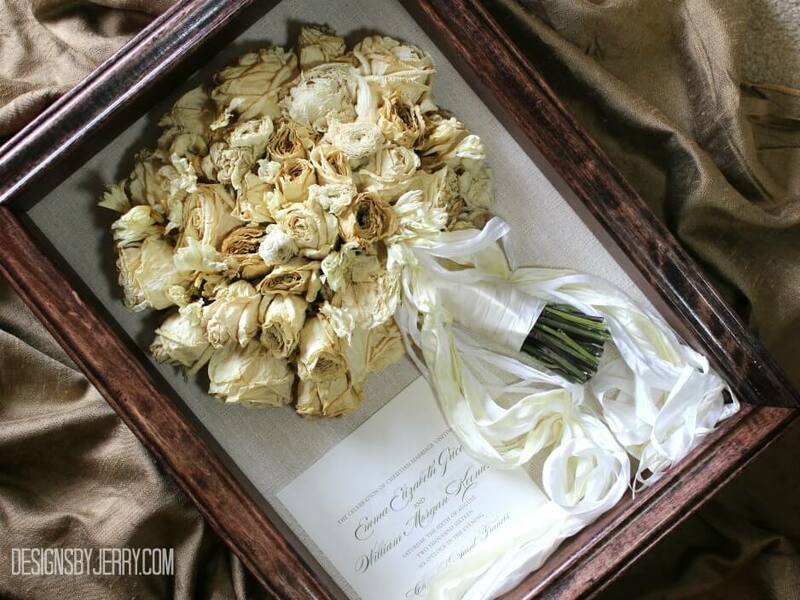 Palm Fronds highlight this preserved bridal bouquet. Click Here To Enlarge Photograph You can never underestimate the the romanticism of an old Southern Plantation Wedding. 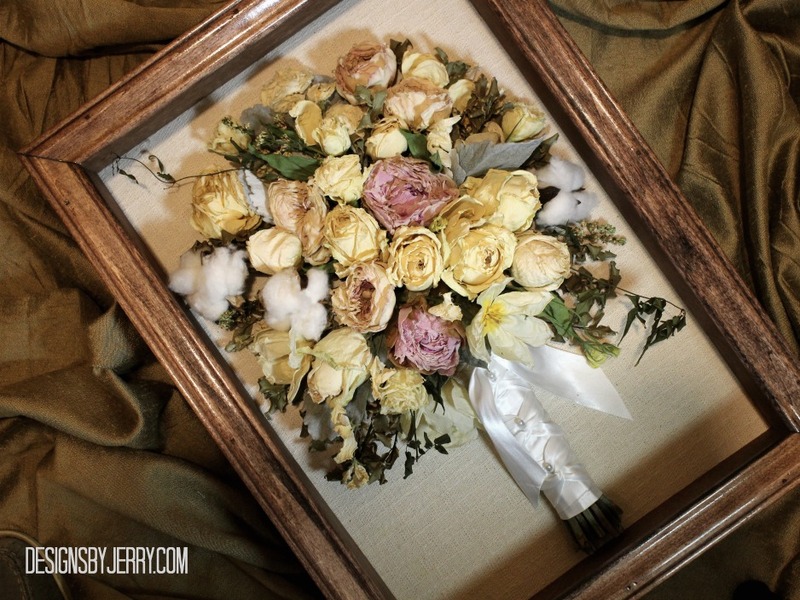 This Bride chose Cotton as the main "flower" for her wedding. 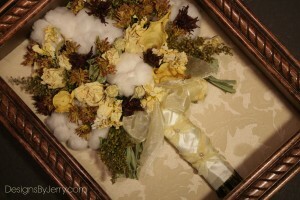 She added in Stock Flowers, a few Calla Lilies and Fall Mums to have a beautiful Fall Wedding Bridal Bouquet. Located in Huntsville, Alabama, Designs By Jerry at Bishop's Flowers has been preserving wedding flowers for over 10 years now. Call 256-679-6227 or 256-539-2711 for more details about preserving your wedding flowers. 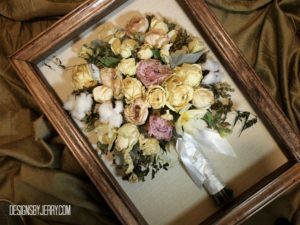 In the meantime, enjoy previewing some of the recent bouquets we have preserved...just click on the images on your right so see more! 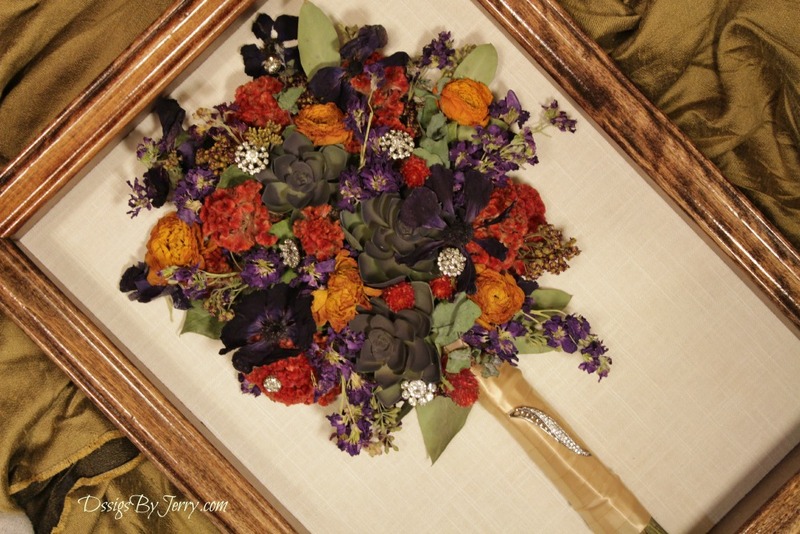 Designs By Jerry does not ship our finished product due to the fragile nature of the dried flowers. You must bring us the flowers and come back to Huntsville to pick up the finished product. 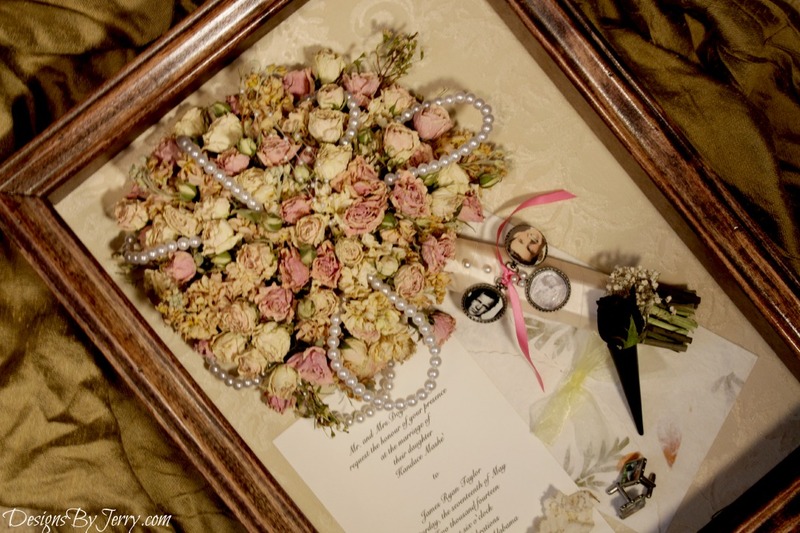 All flowers will shrink and take on a darker color giving you a beautiful Victorian-style memento of your special day! Cotton balls are the focal point of this preserved bridal bouquet. 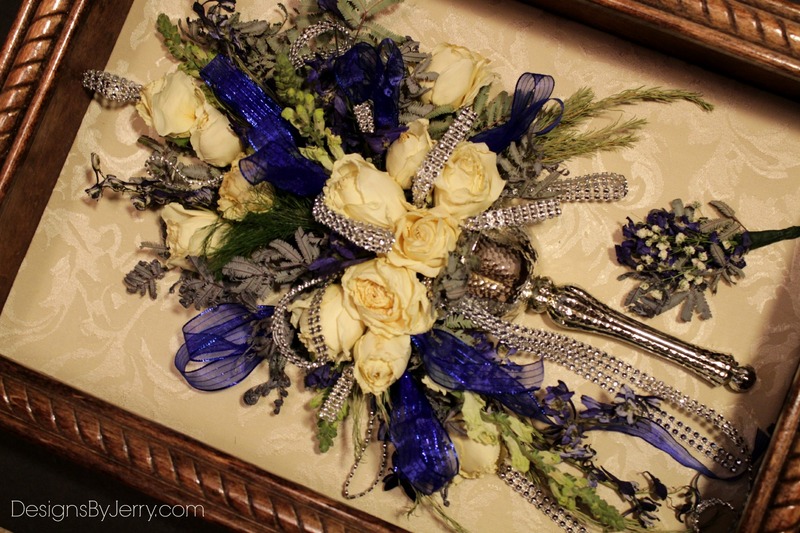 Click To Enlarge Photograph The bride chose Royal Blue and Silver as her accent colors for her wedding. 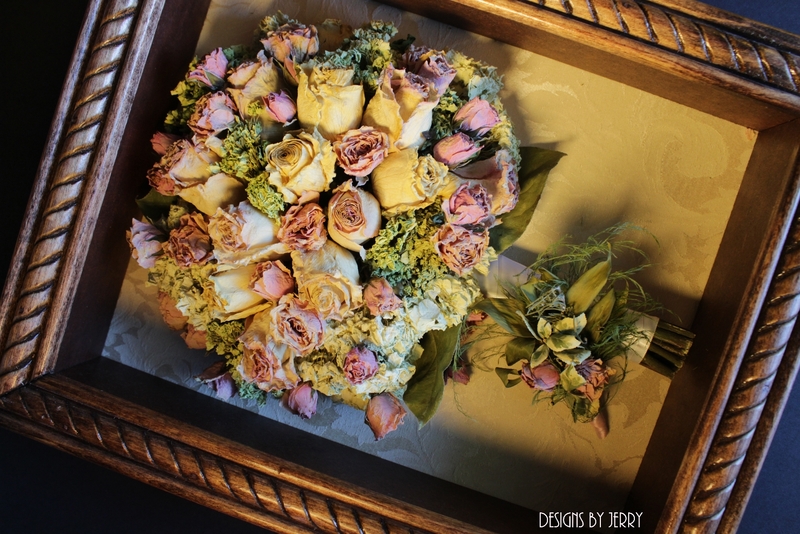 Her wedding bouquet was assembled iin this beautiful Tussy Mussy holder which allowed the florist to create a unique design. This bouquet has some striking lines with white snapdragons and dark blue delphenium creating the beautiful line work. We added the white roses and white mini calla lilies and accented the bouquet with acaia foliage. 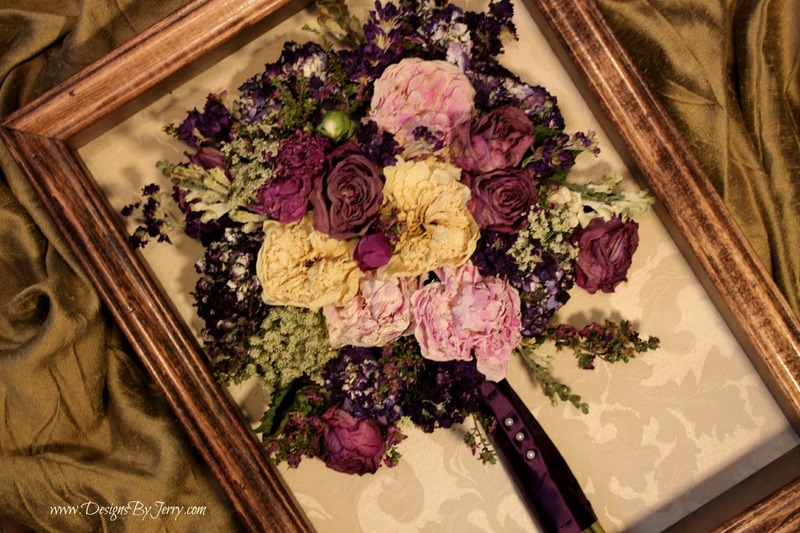 Located in Huntsville, Alabama, Designs By Jerry at Bishop's Flowers has been preserving wedding flowers for over 10 years now. 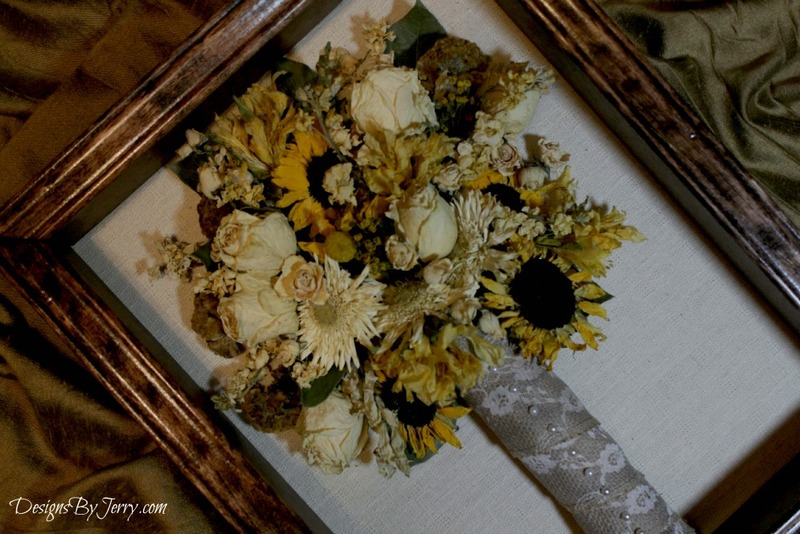 Call 256-679-6227 or 256-539-2711 for more details about preserving your wedding flowers. In the meantime, enjoy previewing some of the recent bouquets we have preserved...just click on the images on your right so see more! 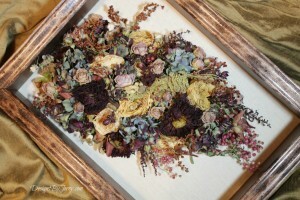 Designs By Jerry does not ship our finished product due to the fragile nature of the dried flowers. You must bring us the flowers and come back to Huntsville to pick up the finished product. 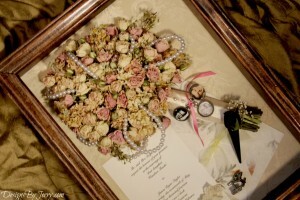 All flowers will shrink and take on a darker color giving you a beautiful Victorian-style memento of your special day! Click To Enlarge Photograph Located in Huntsville, Alabama, Designs By Jerry at Bishop's Flowers has been preserving wedding flowers for over 10 years now. 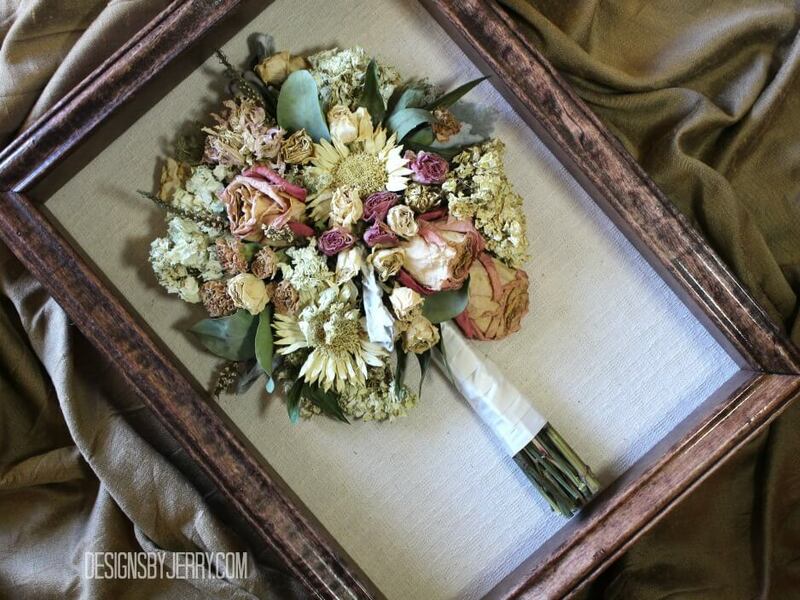 Call 256-679-6227 or 256-539-2711 for more details about preserving your wedding flowers. 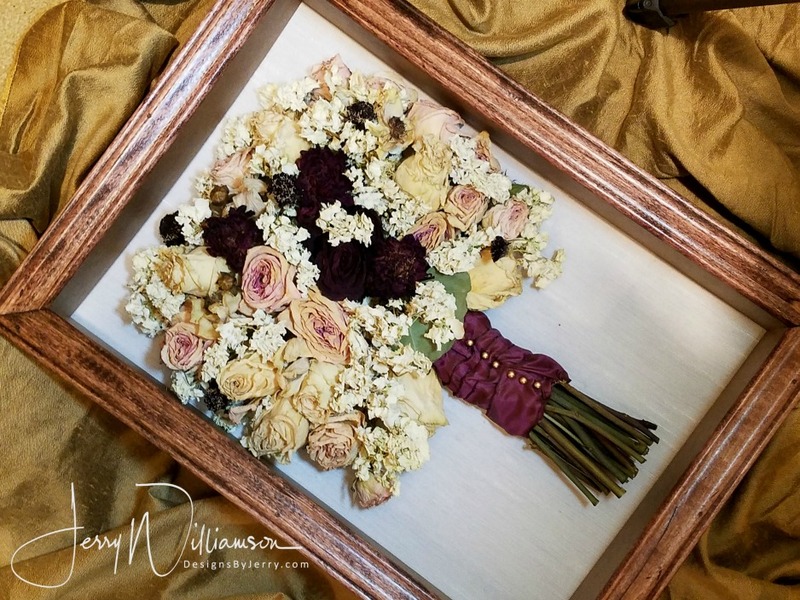 In the meantime, enjoy previewing some of the recent bouquets we have preserved...just click on the images on your right so see more! 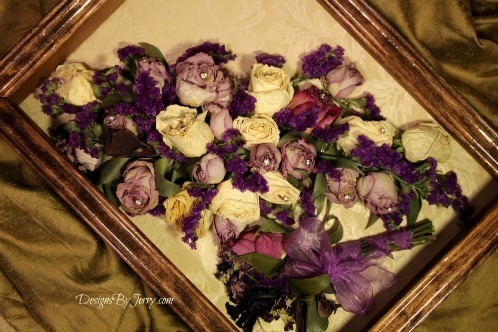 Designs By Jerry does not ship our finished product due to the fragile nature of the dried flowers. You must bring us the flowers and come back to Huntsville to pick up the finished product. 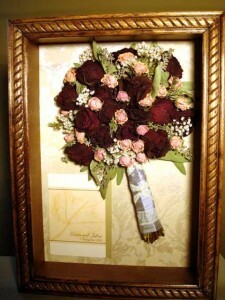 All flowers will shrink and take on a darker color giving you a beautiful Victorian-style memento of your special day! Click To Enlarge Photograph The bride chose an exquisite mix of flowers for her fall wedding and we preserved those flowers for her. Dahlias preserve their shape well, but it is essential that the flowers are of high quality and well kept in order to keep the petals in tact during the drying process. We also have dried roses and white hydrangea in this bouquet which makes for a beautiful arrangement for the bride to hold as she walks down the aisle. 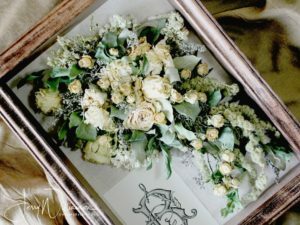 Click Here To Enlarge Photograph In this bouquet, we have preserved white and green hydrangea, cream garden roses, freesia, seeded eucalyptus and salal to make a beautiful Victoria Era looking Bride's Bouquet. 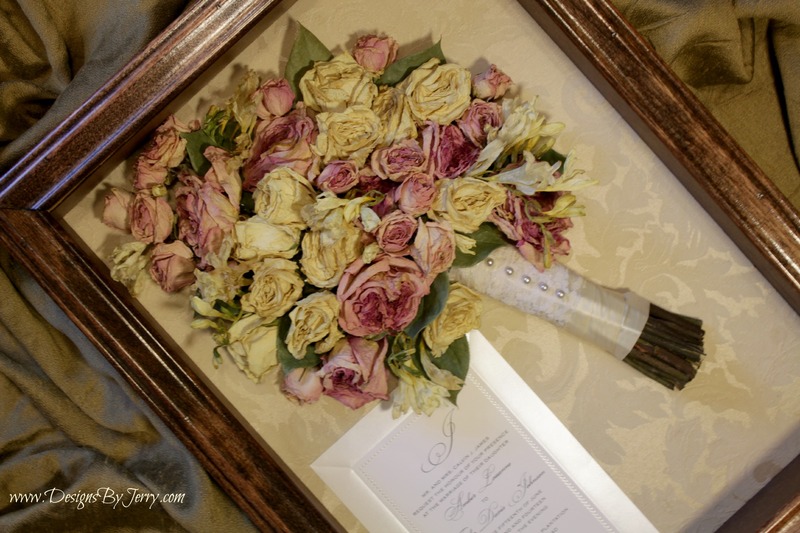 Since we air dry our flowers (with our secret drying system) your wedding flowers and bride's bouquet dry quickly to ensure the longevity of the flowers. 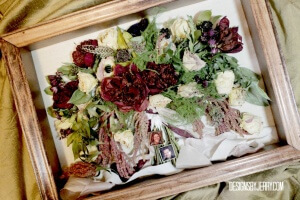 This bouquet that we preserved was a cascading bouquet featuring peacock feathers and died dendrobium orchids. It was a beautiful wedding bouquet. The florist accented this bouquet with purple roses and a few cream roses along with some green hydrangea. 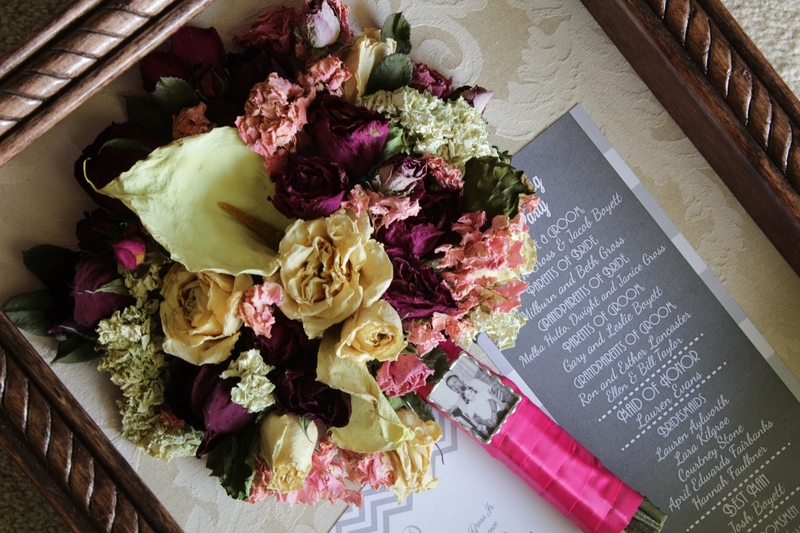 In this beautiful bouquet we preserved the bride's bouquet of vibrant colored roses and pink and hot pink peonies. 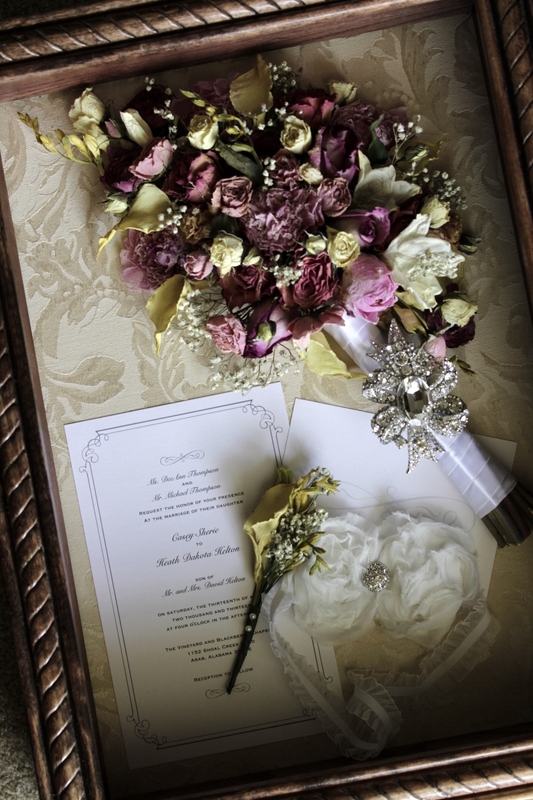 The bouquet was created in a Silver Tussy Mussy which made for a beautiful display. When you are looking for a unique color scheme for your wedding, one of the favorites of brides is green flowers. 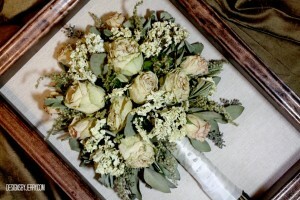 Green Flowers lend such a natural, yet vibrant color that will go with almost any wedding theme!